The economists have declared that the “recession” ended in 2009. It seems funny, but it occurs that it still with us. 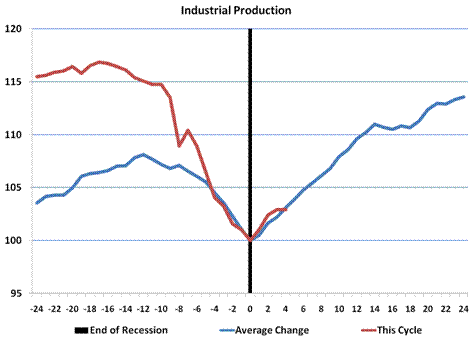 I am not an economist, but I have lived through several “recessions” over the past 50 years. The thing that surprises me, is when you think about it, there are still people, there are still customers, thre are still people providing services, providing goods. What is the recession then? Is it that people do not have money to spend? Is it that people do not have the credit to make major purchases? Is it that people are out of work? Is it that people are insecure regarding spending money? Is it that organizations are insecure of loaning money? It can’t be that there is less money. Money is just agreement. We are not on the gold standard, so there doesn’t need to be gold bars in a bank to have money. Money is just printed up. Maybe the recession is the “agreement” that we don’t have money, and we don’t have good credit to make purchases. I have this mental picture of people sitting at their homes, going to their jobs, and then spending the money they make on services and products they need and desire. Is a recession, when we compare what we have, and what we can buy with what we used to be able to have and buy? If we don’t compare our current situation with the past, is there a recession then? I remember when I first moved out from my parents house. I lived in an apartment that only cost me $50.00 a month. (It was an old lawyers office, that had been converted to an artist’s studio. It was illegal to live there, but the owner turned a blind eye to my situation.) I recall working as a waiter, for minimum wage and tips. I bought my food at Trader Joes, and my clothes at the Salvation Army. I bought items at the local pawn shop. I was a college student, and paying my tuition, and paying for my books, and was able to make ends meet working as a waiter. 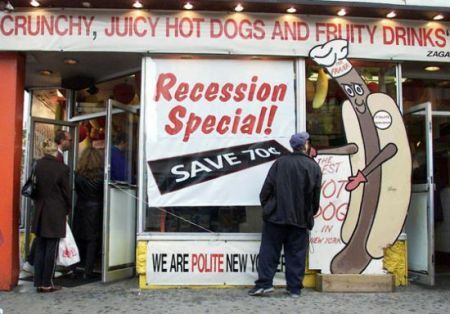 To me there was no recession. It was 1977. Each year, I made more money, moved out of my art studio to a legal apartment. I got a new, full-time job as a civil engineer, got married, and moved into a better apartment, then boom, in 1982, a recession hit. I lost my job. We had to move out into a smaller, cheaper apartment. I had my first child. I was out of work for 3 months. As my son, was learning how to walk, I was despondant, resigned, frustrated, and worried about the future. I watched him try to rise to his feet, only to lose his balance and fall flat on his rear end. However, with every failure, he did an amazing thing. He would giggle. He thought it was funny everytime he fell down. I watched him in amazement as he would just pick himself back up and try again. Each failure didn’t mean anything to him. I saw that I had made my three months of failures to find a job, mean something. I made it mean that I was a failure. I made it mean that my situation was impossible. I had been told over and over that I was over-qualified. I had three universary degrees. My previous job as a civil engineer, seemed to black-list me from getting any work. I made it mean that I was in an impossible situation. Watching my son in his struggle to learn how to walk inspired me greatly. I told my wife, I was going out to find a job, and would not come back without one! I had circled four ads in the classified section of the paper and drove off. I remember being in an interview. The owner told me the same words I had been told over and over. I was over-qualified, that they couldn’t pay me what I wanted. This time however, I was determined, and positive, and certain that I was going to get the job. I told the owner, that he was right, I was over-qualified, I was higher-paid, AND that this was a real opportunity for him. He would get all of my experience and expertise for a reasonable price, and that he shouldn’t pass up on this opportunity, because I was a real find, and he wouldn’t be able to have someone like me in the future because the current economy made me available, right here and now. He looked at me, was silent a bit, and then said that I was right, and he hired me! 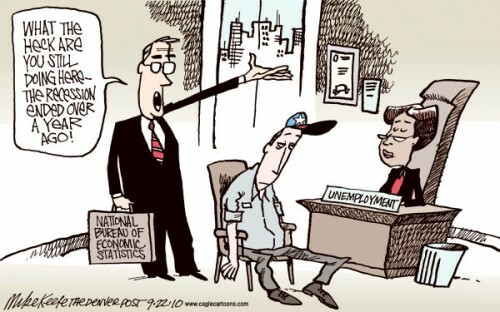 The way I see to end the recession is to take a stand, stick your neck out, and put your rear end on the line, and get a job. Take the pay-cut, take the new experience. Put the past, into the past, and start something new. Like my infant son, everytime you fall on your rear end, pick yourself up and try again to get amusement from the challenge it is to do what you’ve never done before. If each and everyone of us take these first steps, we can walk out of this “recession.” It’s not the economists, or bankers, or board of directors or executives that end the recessions. It is each and every citizen who ends it by making money, and buying goods and services. This is my theory. I invite you to try it out. So far, I’ve seen around seven recessions, and they each ended in pretty much the same manner.